for Administrative Assistants and Managers. Ever notice that the refresh button in version 3.3 might not have worked properly? If you didn’t notice, great! If you did notice, don’t worry we fixed it. If you rely on Out’n About for Outlook for Time Card Reports, Status History Reports, and other reports – we’ve redesigned all of the reports. You’ll enjoy a user friendly and easy to read HTML report. Fire drill? Out’n About can help you with that. Easily print a Roll Call Report and have a convenient way to mark your employees present and away during your fire drill. 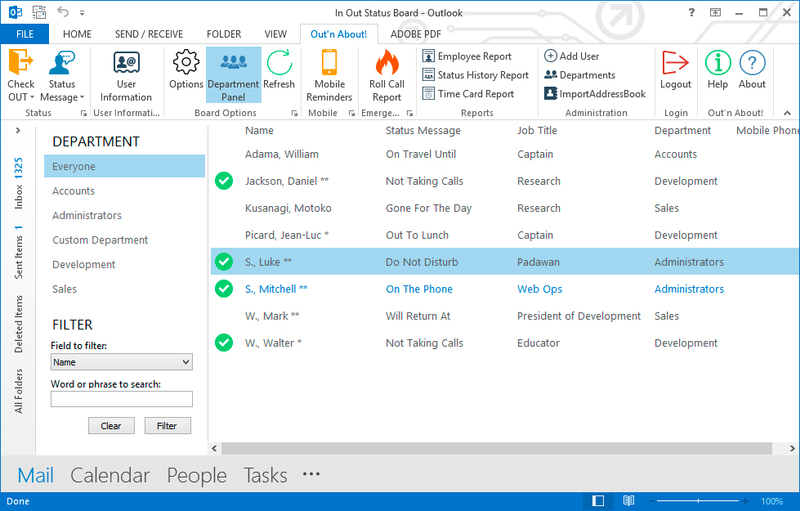 We’re also fully compatible with all versions of Outlook, including Outlook 2016. + Modified Options property sheet to have Outlook options look and feel. Merged Mobile Reminders and Status Messages dialogs into Options. + Fixed Refresh button on ribbon bar to actually work!